Otto Scharmer’s blog below deserves great consideration and discussion. This blog is a bit longer than usual. But if you are interested in the invisible dimension of leading profound social change — and in a blend of action science and consciousness to illuminate that blind spot — it may be worth the read. My father is a farmer. As one of the pioneers of bio-dynamic farming in Germany, he devotes all his attention to cultivating the quality of the soil in his fields. That’s exactly what I find myself doing today, though in a very different type of field. My colleagues and I, along with countless change makers, leaders, action researchers and facilitators, are cultivating the quality of the social field. By social field I mean the structure of the relationship among individuals, groups, organizations and systems that gives rise to collective behaviors and outcomes. When people experience a transformational social shift, they notice a profound change in the atmosphere, in the texture of the social field. But in trying to explain it, they tend to fall back on vague language; and even though people can agree on a surface description of what happened, they don’t usually know why it happened or what words to use to describe it. Today, in most social systems, we collectively produce results that no one wants. These results show up in the form of environmental, social, and cultural destruction. 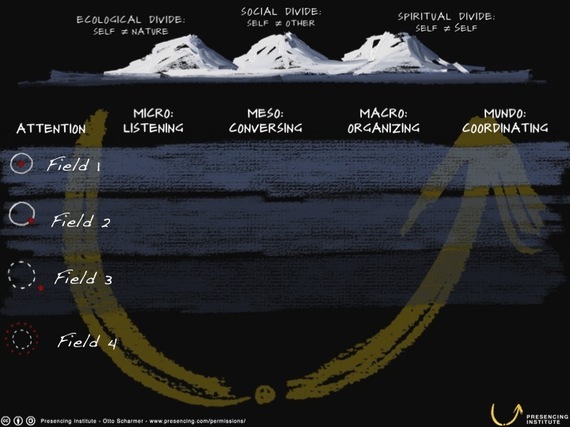 The ecological divide (which disconnects self from nature), the social divide (which disconnects self from other), and the spiritual divide (which disconnects self from self) shape the larger context in every large system change today. The intention of this paper is to uncover the grammar of the social field — the key variables that make it possible for the operating logics and modes (states and stages) of a social field to shift. All human beings participate in co-creating the complex social networks that we live in and engage with. Still, despite the fact that seven billion people are busy co-creating this field moment to moment, the process of social reality creation remains enigmatic because it is connected to our blind spot. Most people much of the time experience social reality as something exterior — as a world “out there” that is doing something to us. That is, most of us are unaware of the process that brings our social reality into being in the first place: the source from which our attention, intention, and action originate when we engage with others and with ourselves. In this essay, I build on the work of one of the twentieth century’s most innovative social scientists, Kurt Lewin. Lewin viewed the social environment as a dynamic field that interacts with human consciousness. Changes in the social environment affect particular types of psychological experience, and vice versa. In his field theory, a field is defined as “the totality of coexisting facts, which are conceived of as mutually interdependent.” He believed that, in order to understand people’s behavior, one had to look at the whole psychological field, or “lifespace,” within which people act. Lifespaces are constructed under the influence of various force vectors. Accordingly, human behavior is determined by the totality of an individual’s context. This context is a function of the field that exists at the time the behavior occurs. Lewin also looked to the power of underlying forces (needs) to determine behavior by integrating insights from topology (e.g., lifespace), psychology (needs, aspirations, etc. ), and sociology (e.g., force fields). Lewin’s field theory was groundbreaking in twentieth-century social psychology and action research and led to the development of numerous experiments and projects. Awareness and sensitivity training in T-groups in the 1950s and ’60s, and the dialogue practices, and organizational learning methods at the end of the century, are all part of this lineage. As I write about social fields from a twenty-first-century perspective, I am able to draw on major insights and sources of knowing that were not available to Lewin when he did his pioneering work — specifically, the most recent research on brain plasticity and neurophenomenology, as co-developed in the work of the cognitive scientist Francisco Varela. The 19 points outlined below describe a journey through the landscape of the social field. That journey goes directly to the blind spot of leadership and social systems theory: although we look at what leaders do (results) and how they do it (processes), we are by and large unaware of the source of social reality creation, the inner place from which they (and we) operate. 1. Wholeness. Social fields are whole. Because all human beings are connected, what happens to other people also happens to an individual. This is not only because everyone shares the same ecosystem and is connected through multiple interdependencies, but, most important, because all people are directly connected to one another, as becomes manifest when we enter the deeper states of the social field. everyone [was talking] from such a deeper level of flow and energy. I must have missed the most important part. I no longer [knew] how to connect to them. 3. Interiority. What differentiates social fields from social systems is their degree of interiority. Social systems are social fields seen from the outside (the third-person view). At the moment we cross the boundary between them and step inside a social system — that is, at the moment we begin to inquire into its interiority by turning the camera around (from the third-person to the first-person view) — we switch the perspective from the social system to the social field. Once we cross this threshold we discover the interiority (or being-ness) of this field — its inner landscape. 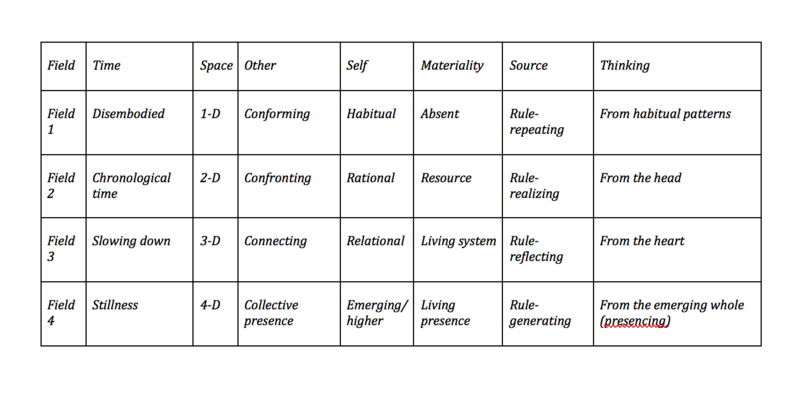 It shows up in the form of different states that transform our first-person experience along the seven dimensions outlined below (points 4-10). Every so often a Celtics game would heat up so that it became more than a physical or even mental game, and would be magical. That feeling is difficult to describe, and I certainly never talked about it when I was playing. When it happened, I could feel my play rise to a new level. It came rarely, and would last anywhere from five minutes to a whole quarter, or more… It would surround not only me and the other Celtics, but also the players on the other team, and even the referees. At that special level, all sorts of odd things happened: The game would be in the white heat of competition, and yet somehow I wouldn’t feel competitive, which is a miracle in itself… The game would move so quickly that every fake, cut, and pass would be surprising, and yet nothing could surprise me. It was almost as if we were playing in slow motion. During those spells, I could almost sense how the next play would develop and where the next shot would be taken… My premonitions would be consistently correct, and I always felt then that I not only knew all the Celtics by heart, but also all the opposing players, and that they all knew me. There have been many times in my career when I felt moved or joyful, but these were the moments when I had chills pulsing up and down my spine. It was almost as if we were playing in slow motion. During those spells, I could almost sense how the next play would develop and where the next shot would be taken… My premonitions would be consistently correct. 5. Space widens. The experience of space opens up. In moments of profound shifts in group processes, participants often sense a widening of the surrounding collective space, particularly upward. When moving from Field 1 to Field 4, the texture of the social space morphs from one-dimensional mental images (Field 1), to a two-dimensional exterior connection between observer and observed (Field 2), to a three-dimensional social space where the observer moves inside what is being observed (Field 3), to a four-dimensional living time-space in which awareness becomes more panoramic and perception takes place from the evolutionary movement of a social field, where one senses the space of future possibility (Field 4). It would surround not only me and the other Celtics, but also the players on the other team, and even the referees. 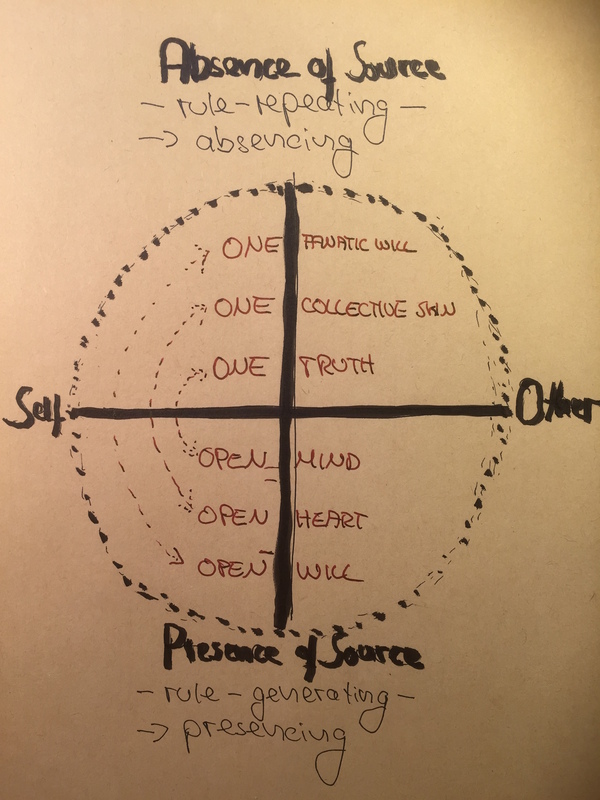 This dimension concerns changes in our experience of intersubjectivity, which can move from polite conformity with existing conventions (Field 1), to interacting with others by discussing real issues and expressing diverse views (Field 2), to connecting and relating to others with empathy and seeing oneself as part of a larger whole (Field 3), to entering a (sacred) space of silence from which a profound sense of connection and collective presence emerges (Field 4). 8. Materiality changes form and quality. The quality of matter and sensual perception also shifts. For example, in moments when social presencing happens, workshop participants often report a “thickening” and “warming” of light. In moving from Field 1 to Field 4, one’s sense of the planet evolves: from a perception of absence (Field 1), to an awareness of its function as a resource (Field 2), to an awareness of its function as a living system (Field 3), to an appreciation of it as a living being or presence that holds the space for connecting to our deepest levels of humanity (Field 4). Our quality of agency can be traced to the source from which social action originates: existing habits and rules (Field 1: rule-repeating), responding to exterior conditions (Field 2: rule-realizing), reflection on both exterior and interior conditions (Field 3: rule-reflecting), or the full presence of the source in the now (Field 4: rule-generating). 10. From habitual thinking to presencing. The quality of thought — thinking — creates the world. As we move from Field 1 to Field 4, our quality (and center) of thought moves from habitual, or the absence of true thinking (Field 1), to thinking from the head by relating to the world as a set of exterior objects (Field 2), to thinking as an activity from the heart that allows us to relate to the world from both outside and inside (Field 3), to thinking as an activity at the source of the social field, that is, from an awareness of emerging future possibilities (Field 4). These four modes of thinking embody four different gateways for connecting to the world: habitual thought (downloading), rational thought (seeing), empathic thought (sensing), and generative thought (presencing). 11. Co-creativity. A social field, once its deeper interiority is activated, turns into a generative field that allows its participants to access their deepest sources of creativity, both individually and collectively. The co-creative flow that occurs in generative social fields can be, in the words of cognitive psychologist Eleanor Rosch, “shockingly effective.” As the stream of emergence deepens, the relationships between the parts and the whole, between individuals and the social whole, shifts in subtle ways. In Field 1, the self is at the center, inside of its own boundaries, locked into its current identity. As the system moves through Fields 2-4, the self functions with progressively more open boundaries and eventually from its surrounding sphere. 12. Non-locality. Generative social fields regenerate and to some degree replicate or multiply themselves over time – -often over many, many years; they also transcend the boundary of space by becoming non-local. Being non-local means that, once I have a deep heart-to-heart connection with the other, I can feel the impact of this relationship and its real-time changes regardless of our spatial proximity. 13. Matrix of Evolution. Activating the deeper levels of the social field is like reintegrating matter and mind on the level of the collective. If the collective body and mind are separate, social systems will download the patterns of the past (rule-repeating). When the collective body and mind are integrated, we see the rise of generative social expressions that operate from a direct connection to source (rule-generating). The Matrix of Social Evolution spells out the idea of moving from body-mind separation to integration. On the horizontal axis we see four system levels of action (individual, group, organizational, and systemic); on the vertical axis we see four degrees of separation between matter and mind. In row 1 we see how the social field manifests when there is full separation between collective body and mind — that is, between action and awareness (Field 1: downloading). By contrast, row 4 depicts how the generative social field manifests when there is full integration between the collective body and mind, that is, collective action and awareness (Field 4: presencing). What is the independent variable that, if shifted, allows us to change the degree of separation between body and mind on the level of the social field? 14. Consciousness. Consciousness is the independent variable that can facilitate a change in the degree of separation between body and mind (or action and awareness) on the level of the collective. The Matrix of Social Evolution spells out the evolution of social fields through four levels of consciousness: traditional (level 1), ego-system awareness (level 2), stakeholder awareness (level 3), and eco-system awareness (level 4). The development of social fields is the embodiment of a human consciousness that is evolving from ego to eco. Viewed from this angle we see the current global ecological and social crisis as a call to shift our way of operating from ego-system to eco-system awareness. Most current systems seem to be stuck on operating levels 1 and 2. How do people shift a social system that operates on levels 1-2 (reactive) to levels 3-4 (generative)? 15. Mirroring. To change the operating levels of a social field, people need a mechanism that helps them bend the beam of observation back onto the observing self. When this happens for the individual (micro), we call it mindfulness. Mindfulness is the capacity to pay attention to your attention. When this happens in a group, we call it dialogue. Dialogue is not people talking to each other. Dialogue is the capacity of a system to see itself. What’s missing in today’s capitalism is a set of enabling or mirroring infrastructures that would help our systems to sense and see themselves and thereby remove the barriers preventing the next round of profound institutional innovation and systems change. Also missing are micro-level enabling conditions that allow individuals and small groups to go through the same shift. What are these conditions? 16. Holding Spaces for Courage, Love, Listening. In early 2015, we asked the 10,000 plus participants in a global U.Lab (an MIT-sponsored MOOC), what it would take to realize their “highest future possibility.” What would it take to bring it into reality “as it desires” (Martin Buber)? Their resounding answer was simple and clear: courage! Then we asked them what support they would need from others in order to actually make it happen, to make it work. Again their answers very clear: love, listening and trust! These responses from a multi-cultural community of change makers are similar to the responses we’ve heard from others. Profound shifts in small groups tend to happen when the two following conditions are in place: (1) individual courage and vulnerability, and (2) a holding space of deep listening with unconditional love. Which leads me to the final question: how to build the capacity to shift social fields on the scale of the whole? My father, like many good farmers, attends to the quality of the soil on the entire farm. But in social fields, our cultivation efforts are broken into many small and often disconnected pieces. The recent rise in popularity of mindfulness practices is a positive development that is beginning to reshape professional practices in education, health, and leadership, among other sectors. In almost all cases, however, we see the power of mindfulness applied to the cultivation of the individual, the assumption being that once there is a critical mass of individual practitioners, they will eventually shift and transform the whole system. That view reflects a naïveté in the current mindfulness movement; it tends to be ignorant about the collective structural dynamics of profound social change. From the perspective of social fields the essential question is: How can we apply the power of mindfulness not only to the cultivation of the individual but also to the transformation of the collective–that is, the evolutionary shift of social fields? Facilitating these shifts in the economy requires a whole suite of institutional innovations. These institutional innovations need to be complemented with innovations in learning infrastructures, such as collective cultivation practices that build the collective capacity to co-sense and co-create. 18. Collective cultivation practices: social field mirroring. To activate the fourth level of the Matrix of Evolution (generative fields) not only requires institutional innovations around the eight acupuncture points but also new learning infrastructures that today exist in part on the micro and meso levels (individual and teams) but that are largely missing on the macro and mundo levels (organizations and systems). Figuring out how to co-create these new learning infrastructures is one of the most interesting challenges of our time. At the MITx U.Lab and the Presencing Institute we have developed and tested several building blocks for such collective cultivation practices, including deep listening case clinics, technology-enabled global stillness practices, and Social Presencing Theater. All three of these practices effectively do the same thing: they activate the fourth level of the social field and then turn that field into a mirror that allows the actors to sense and see themselves from the evolving whole. In the case clinic, the mirroring is effected through deep listening and then reflecting back images, feelings, and gestures that embody the essence of the case at issue. In global stillness practices, the social field is activated by a real-time global community engaged in a guided meditation exercise: people connect to their individual selves, to the planet, and to the collective social field and then look back on themselves from the perspective of the evolving whole. In Social Presencing Theater, an art form that blends mindfulness, constellation practices, and social science, the generative social field is activated through spontaneous body sculptures that represent the deeper dynamics of the current social field, and then inquiry into the possibilities of transformation. The mirroring in Social Presencing Theater happens through first enacting, then debriefing, and finally reflecting on the deeper transformation dynamics of the social field. These mirroring processes, by activating the fourth level of the social field, have an enormous inspirational and transformative power. The MITx U.Lab demonstrated that the fourth level of the social field can be activated in distributed social fields on a global scale. Looking back on our investigation of the landscape of the social field, one question remains: What are its core dimensions? Many years ago, my friend and MIT colleague Peter Senge triggered the guiding question that resulted in this paper when he talked about the split between matter and mind. Ever since, the question on my mind has been: What does the mind-matter split mean in the realm of the social field? Today I believe there is not only one such split, but two. The two splits are represented by the two core axes of the social field. 19. Two core axes of the social field: collective body-mind and self-other. The vertical axis depicts the body-mind split of the collective–that is, the degree of disconnect between collective action and awareness (presence or absence of Source). The other axis depicts the split between self and other–that is, the degree of disconnect between actors in a social system. Currently, the social field suffers from the combined effect of both splits. Case in point: global climate change. We collectively produce results that no one wants: severe climate destabilization. That’s the body-mind split. Why, then, don’t we wake up? Because at this point the second split kicks in: I am so remote from the people who are beginning to feel the worst impact of climate destabilization that in spite of their suffering, nothing motivates me to move from beginning awareness to action. How does the vertical split, the split between the collective body (collective actions) and mind (awareness) show up in real life? The reintegration shows up in the opening of the mind, of the heart, and of the will (cycle of presencing). The disintegration shows up in their opposites: getting stuck in ONE Truth, ONE collective skin (us vs. them) and ONE fanatical will — a.k.a. fundamentalism or cycle of absencing. The above acupuncture points and infrastructure innovations around social mirroring are leverage points for overcoming this double split, for reintegrating collective action and collective mind on the scale of the whole. The recent results of the global MITx U.Lab prototype in early 2015 and related learning experiences that activate the fourth level of the social field represent a very hopeful beginning. They mark the beginning of a new platform and global movement that aims at integrating science, consciousness, and social change by putting the learners into the driver seat of profound personal, relational, and institutional renewal. Thanks to my colleague Adam Yukelson for very helpful comments and suggestions on a draft of this post! My own book, A More Beautiful Question, draws a direct connection between curious inquiry and many of today’s most innovative entrepreneurs and designers. Design breakthroughs such as the Squarecredit card reader, Pandora internet radio, the Nest thermostat, and the business model for Airbnb all began with curious people wondering why a particular problem or human need existed—and how it might best be addressed. In today’s Silicon Valley, coming up with the right curious question can ultimately yield a payoff in the billions. Use curiosity as a self-motivating force. Use curiosity to inspire and lead others. The Next System Project is an effort to “think boldly about what is required to deal with the systemic difficulties facing the United States.” Can you tell us more about it? It is increasingly obvious to many people that the United States is in a period of social, political, economic, and environmental crisis. On issues of equality, poverty, racial justice, democracy, liberty, and the environment—just to name a few—progress appears to be stalled, or even reversed. Indeed, in many, if not most, important areas, trends have been getting worse for the past three decades or more. It’s also clear that this is no ordinary crisis, at least not one that can be addressed through traditional strategies. The problems run much deeper, and are best understood as part of a deeply rooted, systemic crisis. A systemic crisis requires systemic answers, and the Next System Project seeks to begin a serious nationwide conversation about what a genuine alternative system—one capable of sustaining democracy, liberty, and equality within ecological limits—might actually look like. The Next System Project draws an important distinction between systemic challenges and political, economic, or cultural challenges. Climate change, for instance, is a systemic challenge—not simply a political one. Do humans have any previous experience in dealing with problems like this? There was a time in American history when significant-scale problems could be addressed within the existing system. The New Deal, the Great Society, and early environmental legislation were major accomplishments that were emblematic of this. Not only has that time clearly passed, there is mounting evidence that the conditions that enabled such advances were highly exceptional and not likely to be repeated. Climate change is perhaps the best example: It’s a crisis that threatens the very existence of our species, and yet for decades we’ve been unable to adequately confront the threat. We are now approaching the point of no return, whereby some dangerous degree of climate change appears inevitable. There are obviously no guarantees that systemic change can be achieved, even over an extended period of time. But history is full of examples of people coming together to confront seemingly insurmountable problems and, over time, achieving far-reaching change. Just in recent decades, who would have predicted the fall of the Berlin Wall and Soviet-style communism? Or the end of white supremacy and the Apartheid system in South Africa? Or the crumble of dictatorships across Latin America? It’s impossible to know how far we can go toward halting climate change and achieving other important goals if we get truly serious about the sources of the problems. As you said earlier, “systemic crisis require systemic answers.” Are there any examples of these kinds of solutions in play in the world right now? Change almost always begins at the bottom. Precisely because of the failings of the existing system, around the country (and throughout the world) we are seeing the steady build-up of new experiments and new proposals, new ideas and new activism, and above all a new basis for hope. Worker-owned firms, for instance, are taking root in several American cities and regions, many of which are inspired by the Mondragón cooperative network (Mondragón offers an alternative to large, for-profit multinational corporations; read more about it in the May/June – July/August 2014 issue). Likewise, in Boulder, Colorado, a powerful movement to put private utilities in the hands of citizens offers the promise of dealing with local sources of global warming. Urban farming, regional foodsheds, and food hubs—some with important alternative ownership and operational models—are also proliferating around the country. Socially responsible small businesses are forming and gaining legal recognition, and they’re coming together in political and economic alliances. The list goes on. All of these experiments and models point to different ways of organizing our economic life, ways that begin to suggest some of the elements of a very different system. How will The Next System Project weave individual initiatives like these into a comprehensive whole? The first goal of our project is to help legitimate and encourage public discussion of these critical issues. Many on-the-ground practitioners and activists doing this work on a daily basis have important ideas about systemic change—and especially about how, step by step, we might get to an alternative system from the existing one. There are also many writers and academics who have developed, or are developing, alternative systemic models. One of the goals of the Next System Project is to bring all of these people together in a discussion about how systemic thinking can influence local practice. At this stage, what we need are many, many alternative views—and a far-ranging and open debate, from which, one day, a truly democratic and ecologically sustainable future can emerge. How can individuals get involved with The Next System Project, and what should we expect in the coming months? Going forward, the project aims to broaden the discussion around the question: “What comes next?” We will be hosting a national webinar on May 20th; register here. Through targeted research and on-the-ground engagement, we are also hoping develop plans to explore how a city, a state, a region, and ultimately the nation might incorporate “next-system” thinking. The goal is informed discussion of concrete alternatives, so that we can radically expand the boundaries of political debate in the United States. People from all walks of life have added their names to the call for a wide-ranging discussion of the systemic crisis, and for the need to begin to define systemic alternatives. To read our statement on the crisis, and to add your name, visit the Next System Project website at www.thenextsystem.org. Proper questioning has become a lost art. The curious four-year-old asks a lot of questions — incessant streams of “Why?” and “Why not?” might sound familiar — but as we grow older, our questioning decreases. In a recent poll of more than 200 of our clients, we found that those with children estimated that 70-80% of their kids’ dialogues with others were comprised of questions. But those same clients said that only 15-25% of their own interactions consisted of questions. Why the drop off? Think back to your time growing up and in school. Chances are you received the most recognition or reward when you got the correct answers. Later in life, that incentive continues. At work, we often reward those who answer questions, not those who ask them. Questioning conventional wisdom can even lead to being sidelined, isolated, or considered a threat. Aside from not speaking up enough, many professionals don’t think about how different types of questions can lead to different outcomes. You should steer a conversation by asking the right kinds of questions, based on the problem you’re trying to solve. In some cases, you’ll want to expand your view of the problem, rather than keeping it narrowly focused. In others, you may want to challenge basic assumptions or affirm your understanding in order to feel more confident in your conclusions. In today’s “always on” world, there’s a rush to answer. Ubiquitous access to data and volatile business demands are accelerating this sense of urgency. But we must slow down and understand each other better in order to avoid poor decisions and succeed in this environment. Because asking questions requires a certain amount of vulnerability, corporate cultures must shift to promote this behavior. Leaders should encourage people to ask more questions, based on the goals they’re trying to achieve, instead of having them rush to deliver answers. In order to make the right decisions, people need to start asking the questions that really matter. Tom Pohlmann is head of values and strategy at Mu Sigma. He was formerly Chief Marketing and Strategy Officer for Forrester Research, and previously led the company’s largest business unit and all of its technology research. Neethi Mary Thomas is engagement manager at Mu Sigma, where she leads global engagements for Fortune 500 and hyper growth clients in the West coast. She is a seasoned analytics consultant and P&L owner. Several things prompted me to write this piece: An extraordinary client who is one of the most open-minded persons I have ever had the privilege of working with; The aftermath of what happened to Charlie Hebdo and a request by ICF Poland for us to give a 60-minute talk in March- our chosen topic is ‘Working with Polarities’. The connector in my mind between the three things is ‘diversity’. In thinking about this topic of diversity or and our ability to embrace difference, it struck me how open we really need to be in order to allow for difference to exist and thrive. It is totally counter-intuitive to respond to difference with some form of defence or attack rather than to see it as part of life. Maybe even better is to look at differences in terms of ‘how we fit in each other’s world’, a lovely phrase used by Joe Sacco, Guardian (http://www.theguardian.com/world/ng-interactive/2015/jan/09/joe-sacco-on-satire-a-response-to-the-attacks). My realisation is the extent to which we do not like negativity, dissatisfaction, disconfirmation, dissent. We fear being old, ugly, vile, out of control, lost, impotence. But nature and life is all of these things so how is it that we have come to this place of denial, fear and rejection of nature? Our fear of difference is especially true in organisation life- we want conformity, unity, consistency—‘alignment’- as close to 100% as possible. We don’t really want to hear ‘no’ and not too much ‘why?’ either. People who push-back are seen to be difficult and problems to be solved or challenges to overcome. Equally, positive people could also be seen to be wrong or fake. We end up in a blandland of political correctness. I am not sure whether we have yet learnt to give and take, to look for ways to accommodate each other- not yet. If we were to step back a little and examine our expectations and behaviours, we might start to see that our way of thinking and our expectations are totally skewed, lop-sided and unrealistic! To deny that everything has upsides and downsides is to deny life itself: The yes’s and the no’s; the ‘good’ and the ‘bad’. If we follow this train of thought, maybe it is not desirable to strive for 100% employee satisfaction. Maybe indicators of employee engagement is discomfort and controversy and in this environment, we would expect that everyone like some things but not everyone will like everything and there are many sub-groups and interest groups and that ‘majority’ is a warning sign? Maybe a grown-up organisation is one where we willingly give up something so that another constituent can get a little of what they want or need. In my view, this type of give and take is not the same as compromise where we feel we are losing something. This behaviour- of accommodating/ making space/ allowing is a feeling that although we are giving up something, we are gaining something as a whole- because someone else is getting something. In such a diverse organisation, we would not expect someone else to ‘take control’ because we would understand that being able to balance giving and taking is core to maintaining this type of diverse community. Perhaps we would learn to expect that individually, it is normal we don’t always get our way so that others have a chance to get a little of what they need or want. In such a system, we would have an interest in the overall health and balance of the whole and understand that we are part of that whole and as such, we are always contributing to all as all is always contributing to us. What is the role of leaders in such an organisation? Maybe leaders are the ones who help us individually and as a group to listen and learn from each other. Maybe their role is to facilitate flow- movement of ideas, information, configurations of people. Maybe leadership in this context is simply practicing and modelling an open mind-space and an open organisation space for everyone and everything to naturally flourish. If we focused on and advanced these eight key acupuncture points we could begin to transform the old system of capitalism into an economy that creates well-being for all (But what is the animating force that could move this ego to eco shift from small seeds to action? What I saw in the BALLE conference, and what I am seeing in various other places across the planet, is that something begins to grow together that belongs together: the power of entrepreneurship — and the power of the awakening intelligence of the heart. I turned down several opportunities to become a professor, and in July of 1969 moved with my wife and two children to Washington, D.C., to begin work as a community organizer. No one could understand what I was doing, beyond committing professional suicide. In truth, I could not explain it to myself, except to say that it was something I “couldn’t not do,” despite the clear odds against success. I had no training or experience as a community organizer; much of the work had to be funded by grants I had no track record at raising; and I was an idealistic and thin-skinned young man temperamentally unsuited for the hard-nosed world of community organizing. Compared to accepting a salaried and secure faculty post, as such posts were back in the day, I was stepping off the edge into “a kind of free-floating existence under a state of risk.” Companions would have been comforting, but few are to be found when you go over the cliff. Meeting Merton After five months in D.C. — when the thrill of my free-fall had been replaced by the predictable bruises, cuts, and broken bones — I walked into a used book store near Dupont Circle. A friend had recommended that I read The Magic Mountain by Thomas Mann. It was not on the shelf, but in the place where it would have been was another book I knew nothing about: The Seven Storey Mountain by Thomas Merton. I remember thinking, “It’s about a mountain and the author’s surname begins with M. Close enough…” So I bought it. That was early in December, 1969. Merton, I soon learned, had died almost exactly one year earlier. But he came alive as I read his autobiography, as he had for millions before me. I never felt that I had merely discovered a new author worth reading. Instead, I knew I had met a kindred spirit who understood me better than anyone alive, better than I understood myself, a fellow traveler who could accompany me on the strange path I had chosen — or had it chosen me? Wanting to learn more about my new friend, I set out to read everything he wrote. As Merton devotees know, this turned into a lifetime project. The man published at least sixty books, and that counts only those published while he was alive: I’ve lost count of how many more have been published since his death. Merton’s posthumous literary output is, I believe, the first documented case of “perish and publish.” A few years after I began reading Merton, I learned about his correspondence with Louis Massignon, a French scholar who introduced Western readers to the life and work of al-Hallaj, a ninth century Muslim mystic. Massignon felt that his relation to al-Hallaj was not so much that of a scholar to his subject as it was “a friendship, a love, a rescue.” He did not mean that he had rescued al-Hallaj from historical obscurity, but that the Muslim mystic had reached out across time to rescue him. That’s what Merton did for me as I read and re-read The Seven Storey Mountain. Forty years later, I’m still reading him, still finding friendship, love, and rescue — essential elements in serving as a messenger of hope. Imparting hope to others has nothing to do with exhorting or cheering them on. It has everything to do with relationships that honor the soul, encourage the heart, inspire the mind, quicken the step, and heal the wounds we suffer along the way. Merton has companioned me on my journey and illumined my path, offering life-giving ways to look at where I’ve been, where I am right now, and where I’m headed. I want to say a few words about four of those ways. The Quest for True Self First comes the pivotal distinction Merton makes between “true self” and “false self,” which helped me understand why I walked away from the groves of academe toward terra incognita. No reasonable person would call my early vocational decision “a good career move.” But looking at it through Merton’s eyes, I came to see that it was a first step on a life-long effort to be responsive to the imperatives of true self, the source of that inner voice that kept saying, “You can’t not do this.” I grew up in the Methodist Church, and I value the gifts that tradition gave me. But at no point on my religious journey — which included religious studies at college, a year at Union Theological Seminary, a Ph.D. in the sociology of religion, and active memberships in several mainline Protestant denominations — was I introduced to the contemplative stream of spirituality that Merton lived and wrote about. His notion of the quest for true self eventually led me to Quakerism, with its conviction that “there is that of God in every person.” The quest for true self and the quest for God: it’s a distinction without a difference, one that not only salvaged my spiritual life but took me deeper into it. Wholeness in a Broken World As the Nigerian novelist Chinua Achebe famously reminded us, “things fall apart.” But in “Hagia Sophia,” one of Merton’s most lyrical pieces, he writes about the “hidden wholeness” the spiritual eye can discern beneath the broken surface of things — whether it’s a broken political system, a broken relationship, or a broken heart: “There is in all visible things an invisible fecundity, a dimmed light, a meek namelessness, a hidden wholeness. This mysterious Unity and Integrity is Wisdom, the Mother of all, Natura naturans These words, too, have served as a source of hope for me. Once one has eyes to see it, wholeness can always be discovered, hidden beneath the broken surface of things. This is more than a soothing notion. It’s an insight that can shape what the Buddhists call “right action,” if we have eyes to see. Here’s an instance of what I mean. In the early 1970s — as I was reading Merton and learning about organizing for racial justice in a rapidly changing neighborhood — I began to understand that my job was not to try to compel people to do things they did not want to do, such as protesting against unscrupulous real estate practices like blockbusting and redlining. Instead, I needed to give them excuses and permissions to do things they really wanted to do — things related to the justice agenda — but were too shy or fearful to do under their own steam. For example, the people in the neighborhood where I lived and worked had already run from “the other” once, driven by the fear that animates white flight. But in their heart of hearts, they had come to understand that there is no place left to run, no place to escape the diversity of the human community, and that embracing it might bring them peace and enrich their lives. I knew that step one in stopping real estate practices that manipulate fear for profit was simple: give the old-timers and the newcomers frequent chances to meet face-to-face so they could learn that “the other” came bearing blessings, not threats. But instead of asking folks to do the impossible — e.g., “Just knock on a stranger’s door and get to know whoever answers” — my colleagues and I began creating “excuses and permissions” for natural interactions: door-to-door surveys, block parties, ethnic food fairs, and living room conversations about shared interests, to name a few. Amid the racial tensions of our era, we helped people act on their deep-down desire to live in the “hidden wholeness” that lies beneath the broken surface of our lives. And it worked. Over time, because of our efforts and those of many others, a community that might have ended up shattered became diverse and whole. Things do not always work out so well, of course. History is full of tragically failed visions of possibility, and the more profound the vision, the more likely we are to fall short of achieving it. But even here, Merton has a word of hope for us, a paradoxical word, of course: “…do not depend on the hope of results. …you may have to face the fact that your work will be apparently worthless and even achieve no result at all, if not perhaps results opposite to what you expect. As you get used to this idea, you start more and more to concentrate not on the results, but on the value, the rightness, the truth of the work itself.” As long as we are wedded to “effectiveness” we will take on smaller and smaller tasks, for they are the only ones with which we can get results. If we want to witness to important but impossible values like love, truth and justice, there must be a standard that trumps effectiveness. The name of that standard is “faithfulness.” At the end of the road, I will not be asking about outcomes. I’ll be asking if I was faithful to my gifts, to the needs I saw around me, to the ways in which my gifts might meet those needs, to “the truth of the work itself.” For helping me understand this — and for imbuing me with the faith that, despite my many flaws, I might be able to live this way — I owe a debt of deep gratitude to Thomas Merton, friend, fellow traveler, and messenger of hope. (I have saved my favorite Merton line for the end of this piece, relegating it to the status of a footnote to keep myself from prattling on about it: “I had a pious thought, but I am not going to write it down.”) This essay appears in We Are Already One: Thomas Merton’s Message of Hope—Reflections in Honor of His Centenary (1915-2015) from Fons Vitae Press. James Carmody of the Center for Mindfulness at University of Massachusetts Medical School is one of the co-authors of the study, which was supported by theNational Institutes of Health, the British Broadcasting Company, and the Mind and Life Institute. For more information on the work of Lazar’s team.